This amazing view of a Perseid meteor was captured by amateur astronomers Stojan Stojanovski, Kristijan Gjoreski and Igor Nastoski of the Ohrid Astronomy Association in Ohrid, Macedonia, during the peak of the Perseid meteor shower on Aug. 12-13, 2015. This year's Perseids may prove even more dramatic. We are now less than a month away from the peak of the annual summertime display of shooting stars known as the Perseid meteor shower. And if conditions are favorable, there is a good chance that this year's performance could turn out to be better than average, thanks to a gravitational boost by the planet Jupiter. 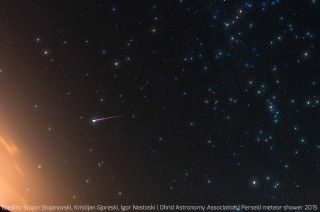 Assiduous observers have already begun to see members of the Perseid meteor stream — unusually early, as the shower's forerunners do not usually begin to make their appearance until the third week of July. While meteors appear on the order of only a few per hour at present, their numbers will begin to ramp up in earnest after Aug. 7, reaching their maximum during the predawn hours on Friday, Aug. 12. The meteors appear to radiate from the constellation of Perseus — hence the name Perseid. Perseus begins to rise out of the northeast around 10 p.m., and by 4 a.m. it has climbed high in the sky, almost to a point that's directly overhead. The meteors are the dross of the Swift-Tuttle comet, which was discovered in July 1862 and reappeared in the fall of 1992. The comet has probably circled the sun dozens of times and has left a "river of rubble" in its wake. The Earth's orbit passes by this rubble river every year in mid-August, creating the annual display of shooting stars. The average Perseid, just visible to the naked eye, is scarcely larger than a grain of sand. It is invisible until, upon entering our atmosphere at speeds of up to 37 miles (60 kilometers) per second — over 133,000 miles (214,000 km) per hour — its kinetic energy is used up in such processes as the production of light, heat and ionization. Thus, such a small particle can be seen for a few hundred miles as a bright streak of light in the sky. So what we are seeing is the light energy it develops, not the particle itself. The majority of Perseid meteors become visible at about 70 miles (113 km) above the ground and die out at a height of about 54 miles (87 km). This year should be better than average because of Jupiter's alignment with both the Earth and the Perseid stream. Before intersecting Earth next month, the tiny Perseid particles will have passed close enough to the biggest planet in our solar system to be shifted closer to the Earth's orbit. While a single observer might see as many as 60 to 90 meteors per hour during a normal Perseid shower, thanks to this gravitational boost from Jupiter, the meteor rate this year might be noticeably higher. It should be stressed that for best results, observations should be made far from big cities where smoke, haze — and bright lights especially — will shut out all but the brightest meteors. City dwellers will be able to see Perseids, but at a much reduced rate. The darker your sky and the fewer the obstructions (such as nearby buildings or tall trees), the more meteors you will see. Space.com will have many more details on this year's Perseids in the weeks to come. So stay tuned! In the meantime, get out your calendar and put a big circle around Aug. 12 — and let's all hope for clear weather.